While the league is open to non-Muslim players, its atmosphere is undeniably Islamic. League rules prohibit cursing, taunting and gaudy jewelry. Teams are named after prominent cities in the Muslim world: Mecca, Medina, Istanbul, Cairo, etc. It’s common for the action to come to a halt between games while teammates and opponents line up shoulder-to-shoulder to pray together. 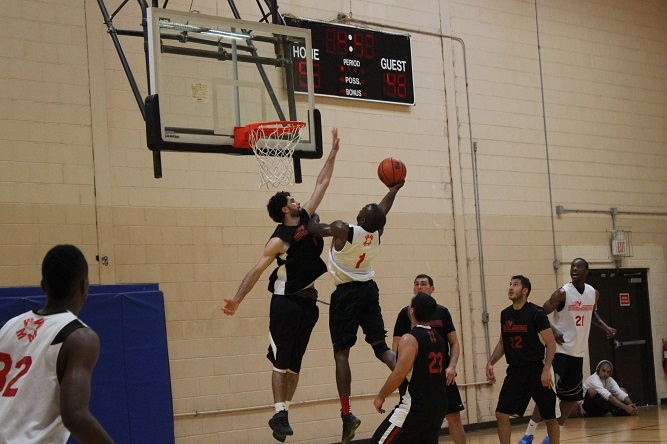 UMMAH SPORTS: What is Muslim Basketball? Essad Malik (director): Muslim Basketball is a league geared toward players age 16 and up, but we also have people that are much older, in their 30s and 40s, playing in the league. We started the league with the idea of bringing Muslim youth together, but it’s grown into bringing everybody in the community together, regardless of age or faith. Omar Abbassi (commissioner): One of the ideas behind the league is that you can play basketball without a lot of the disrespectful stuff that typically goes on inside the game. There are rules built in — no cursing, no trash talk, not even pointing at somebody — the kind of stuff where we take an Islamic perspective on it. And it doesn’t come off negatively. It doesn’t prevent people from coming back or prevent new people from joining every season. You can play basketball with respect and have just as much fun, and it doesn’t take anything away from the game. Talk about how it got started. Essad: The origins of the league started through pickup games that a group of guys started in the summer of 2005. It was one of those grassroots efforts through the course of that summer where one game of five-on-five became three full courts with 30 people playing and even more people waiting to play on the sideline. That was when we thought we had something we can build on; let’s organize everybody into teams and see what happens. That first year, in 2006, we wanted to get six teams and we ended up with eight. We played at an outdoor court in Parsippany, New Jersey. We’ve added new features every year, from stat keepers to using professional referees, to message boards and things like that. Looking back on that first year, we didn’t know what we were doing at the time. We were making things up as we went along. But we definitely saw what people were getting from it, and the feedback we were getting was all positive, and we were able to grow it from there. And it’s all in New Jersey right now? Essad: It’s all in New Jersey. We’re trying to expand north and south in the summer and winter. A lot of it depends on gym availability. Omar: There are some special cases where players make the trip from New York or Connecticut. We did have one player from Pennsylvania. But for the most part it’s all in a 20-30 mile radius in New Jersey. As things grew and matured and we had to expand, we wanted to keep accommodating more players. We didn’t want to neglect players or have anyone have to go away. Right now we have three divisions, three levels of competition. And last season there was close to 200 people (seven to nine per team) and a lot more people signing up. We definitely have more players that want to play than we can accommodate. Essad: We have three divisions full of 12 teams per division. I don’t know if we can possibly fit more per season. Was there a void you were trying to fill, as far as giving Muslims a place to play? We get feedback from some people that this is the only interaction they have with other Muslims their age. I think the type of rules we put in generates a more congenial atmosphere, not the type you’d get at the park or in other leagues. There’s the kind of taboo topic of people who are non-Muslim that play in our league, but they choose to play in our league because the atmosphere we’ve generated and the level of competition they’ve found. How many non-Muslims are in the league? Omar: I’d say 30 to 40 percent of the players are non-Muslim. At this point, though, we don’t really check or ask. As long as they’re willing to compete in the league and follow our rules, it doesn’t matter what religion they are. Essad: Actually, an entirely non-Muslim team has won the championship before. Is this a full-time job for you guys? A hobby? Omar: As far as the amount of time you have to dedicate, it’s like a part-time job. But we’re basically doing this as volunteers. The first season I played in the league, I volunteered to keep stats. Then I was formally asked to be a commissioner. Since then it’s become more than just a hobby. I feel like I have a responsibility, especially to the parents of some of our younger players who are trying to get their kids to play in the league and want them playing in a Muslim environment. Essad: I’d say when the seasons are up and running, and probably two to three months prior, it takes a good amount of time. Most of the free time I have left, I’m putting into the league. When we started out we were all just out of college and single. Now guys are getting married and starting families, and we’re all working full-time. So it’s like we’ve grown up with the league. But that’s one of the challenges as we’ve expanded, is finding people willing to put a lot of time into it, because as we get older we have responsibilities with work and family. Our youngest director right now, he’s still in high school. We’re a non-profit 501c organization. Any money we do make off of fees we collect goes right back into setting up the next season. What’s the best part of being involved with this league? Omar: With the way that our society is in terms of responsibilities and life becoming more about the individual, we’ve lost that sense of community. You work; your wife works; you don’t see your kids a lot. But when I’m going to games here, I take my wife and kids with me. The only time I see my cousins is at these games. I’m a competitive person; I like playing, but I also just like seeing my cousins, I like playing with my kids on the sideline, I like the opportunity to connect with family. One of the things we have taken on is players as free agents, people that nobody knows, and finding ways to get them into the league. You want to get them playing time and make sure they enjoy the experience. A lot of times they barely get in the front door, but when they do, you see they’re on a roster the next season. They’ve been integrated into the community. That’s a good feeling. Essad: Doing all of the prep work beforehand is definitely a lot, but it’s very rewarding when you take a step back and see everything people are getting out of it. It’s a good feeling when all the hard work has paid off and you see all different kinds of people, Muslims and non-Muslims who never would have had the opportunity, interacting with each other. A lot of guys, this is their first time playing any kind of organized basketball, AAU or anything. It’s a great chance to get a style of competition they may not have gotten otherwise. That in itself is satisfying. And then going off of that, seeing the after-effects. Seeing other people setting up their own efforts. There are people in New Jersey setting up Muslim football, softball, soccer leagues … the kinds of things that didn’t exist before. We don’t want to take full credit for starting the ball rolling, but that was a niche that wasn’t being filled. It’s also a great feeling when we say prayer during the night and you get 40, 50 people taking up one line in the gym. We take a break between games to pray, and the non-Muslims are respectful of that. What’s the toughest part of running the league? Omar: For me, the biggest challenge is before the season when teams are signing up — especially for the two lower divisions — and teams sign up in the wrong division. We want everybody to have a good experience, so that part gets pretty tricky, trying to keep teams balanced and not having one team overstacked. The last thing you want to do is prevent teams from playing because they can’t be competitive. One time a team dropped out. That’s the tricky part, having that responsibility to make sure it’s a level playing field and every team has a chance to compete night in and night out. Essad: One challenge, from an organizational perspective, is at the end of every season when we look back and see what we can improve on. We come up with a running list of things we can add – we’ve gone from keeping score with a flipboard to being in a gym with a real scoreboard. We’ve hired professional refs as opposed to reffing the games ourselves. Every season we try to brainstorm new ideas for tangible improvement. Omar: Another part that gets difficult is keeping your home life balanced. You don’t want your wife and kids to feel like they’re not getting your attention. Not that my wife isn’t supportive, but I have a responsibility to her and to the kids. We’re all lucky to have wives that support us. 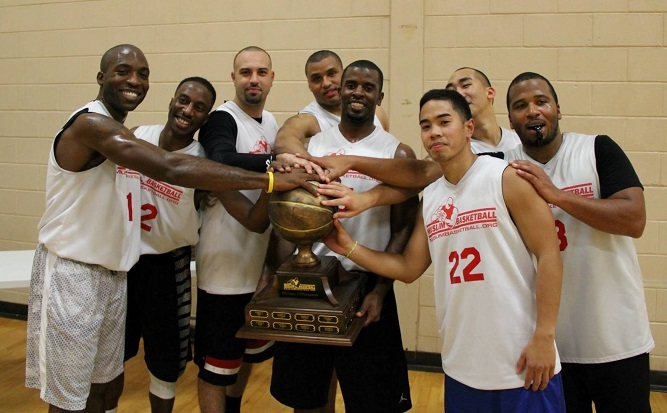 Do you know of any other Muslim basketball leagues around the country? Essad: We didn’t know about any before we started. We didn’t really research ahead of time; we just kind of did it. But it turns out there are a lot of other leagues around the country. There’s the Crescent League in New York City; there are a couple in Texas, in the Houston area; Toronto; several in California. We’ve found out about other leagues the longer we’ve been around. We might pick their brain about things they’re doing that we might want to incorporate. Omar: We’ve had situations where people from other leagues, or people trying to start their own leagues, they’ve e-mailed us asking for pointers or what bumps in the road to look out for. One player who used to play in our league, he moved just outside of Seattle, he wanted to take our model and start his own league. What’s the story behind allowing non-Muslims to play? Essad: We didn’t realize in the beginning that (non-Muslims) would be interested in playing. But as we went along we realized we had something that appealed to them. Our Muslim players had non-Muslim friends who wanted to play, and they had friends who wanted to play. At first we threw in rules like only having a certain number of non-Muslims on a team, but over the last three or four years we haven’t had any restrictions whatsoever. A lot of that has to do with our non-profit status, and a lot of it is we just didn’t want to be an organization that discriminated based on background or faith. Making that decision of inclusion versus exclusion, my thoughts on including people of all backgrounds is, hey, if they’re willing to play in our league and wear “Muslim Basketball” on their shirt, that’s the best form of dawah we can come up with. There’s no reason to close the door in their face. Was there any negative feedback from Muslim players who didn’t think non-Muslims should be included? Or at least that there should be some restrictions? Essad: There was a little negativity, but it was mostly outweighed by positivity. Most people wanted the opportunity to bring in their non-Muslim friends to play. Whenever you make changes like that, there will be a few grumbles here and there. People who were there from the beginning take ownership of the league like, “This is our thing. This isn’t for them, it’s for us.” But overall, those voices were quieted once people saw how great inclusion was for the league. Other than most of the players being Muslim, what separates this league from other rec leagues? Essad: A lot of our refs have worked from youth league up to college, and they’ve told us that the fact that we have rules for no cursing and no taunting — not even finger-pointing — makes our league one of the most well-behaved they’ve seen. One of our refs runs his own league, and he’s adopted our rules in his league simply because he saw the effect they have on people. We have a zero-tolerance policy on trash-talking, showboating, cursing … little things like that go a long way. You see the effect is has on the demeanor of a player. When you take away all of that and it’s just basketball, then it’s like our slogan, “Building brotherhood through the game of basketball.” People have their ideas of the values that Muslims hold, but we aren’t any different than anyone else. We play the same sports, we just choose to do it with certain values. Omar: Everything we do, we try to do it in line with Islamic values. We take fights and altercations very seriously. If you get ejected from a game for anything other than fouling out, you’re suspended for the following game, no questions asked. If you get five technical fouls, you’re out for the season. It puts people in a spot where they aren’t complaining to refs as much because they don’t want to cost themselves or their team. Essad: It’s about holding ourselves accountable to a higher standard of behavior. A lot of guys that play in the league are either in college or working. This is their free time, and I think we all agree we want to spend it playing basketball rather than dealing with all the arguing and other stuff. What are your basketball backgrounds? Omar: I went to a private Muslim school. We had a basketball team, but we didn’t compete much. We weren’t in a league. In college I played intramural and pickup games, then in a bunch of rec leagues. We used to go around looking for leagues to play in, driving around for four- and five-hour trips just to play in a tournament. Essad: I didn’t play in high school or anything like that. Most of the people in our league are kind of the same; they just grew up loving the game through pickup and intramurals. Essad: Our top division has a lot of people who played in high school, and some that played in college on various levels. We’ve had Marcus Toney-El, he played at Seton Hall, and Ibrahim Jaaber, he was Ivy League Player of the Year at Penn, as part of the league. Another guy who played in our league had a D-League tryout. Omar: Last season we had Mahmoud Abdul-Rauf as our guest for a weekend; he went to some games and events we had and played in a game. Omar: He did OK (laughs). He can definitely still play. He showed his stuff, but he was mostly deferring to other players. He had a couple really nice shots, though. Ibrahim Jaaber, he played in our All-Star game, and I’ll just say he’s very difficult to stay in front of (laughs). He was on the scoring end of the game-winning alley-oop. We have Almin Hodzic, he played at a Division-III school here in Jersey. I think he had a tryout with his national team. What advice would you give to somebody who wanted to start a Muslim basketball league in their city? Essad: Don’t get discouraged, because it’s not going to happen overnight. The first thing you need is a good team. Assemble a good team of people that know up-front that they’re going to have to put a lot of time into it. Finding a reliable gym is really important. That’s one of the biggest hurdles is just finding a place to play that you can count on year in and year out. Omar: Before I joined this league, I was one of those people who was like, “It’s a Muslim basketball league. How good can it be?” But since I walked in the door, I’ve never walked out. That’s going to be one hurdle when you’re getting started, is trying to get people to see that it can be a respectable league. You mentioned the league being a form of dawah. Can you expand on that? Omar: I think it’s a form of dawah in that a lot of non-Muslims don’t know anything about Islam except for all the stereotypes. They have a certain vision of Muslims in their head. When they come play in our league, then they see we’re just a bunch of regular people. We don’t fit that stereotype that’s out there. Muslims have been painted with a pretty bad picture, but our non-Muslim players learn to disassociate that image from what they see with us, and they form friendships that last for years. When we pray, they’ll sit back and be very respectful of it. I think that visual really gets wheels turning in their head that weren’t turning before. And honestly, we can probably take on a bigger responsibility with (dawah) and push it further. Essad: It’s always a debate. How forceful do you want to be with it? Do you want to be more passive, or upfront performing direct dawah? Whichever way we go, it’s really important to portray Muslims in the best light possible. (The league) shows people who may not realize it that we are born and raised in this country – that we’re Americans as well as Muslims. We’re playing the same game they are. And when they recruit their non-Muslims friends to come play, that reinforces the dawah.